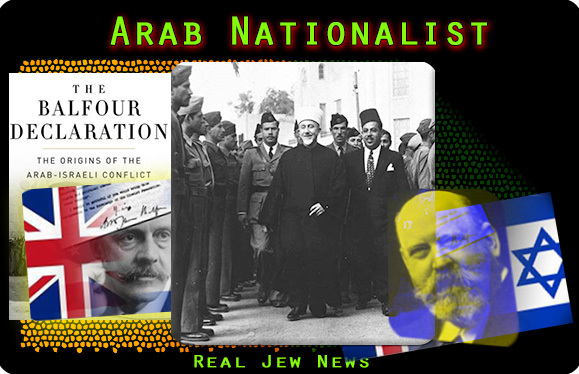 THE JEWISH DEMONIZATION of the Grand Mufti of Jerusalem and Arab hero, Haj Amin al-Husseini, as a “pro-Nazi” war criminal, is a devious lie that Jews are prone to vomit forth. Fact is, the Grand Mufti, born in Jerusalem and growing up as an Ottoman Arab, (Ottoman Turkey sided with Germany in WW 1), was an Arab Nationalist—NOT an “Evil Nazi”™—who opposed the French and British Mandates as well as the Zionist colonization of Palestine. German National Socialism and Islam each rejected democracy, usury, global capitalism, communism, imperialism, and colonialism, and emphasized the “folkish spirit” of a people—the ummah—led by a strong leader that people trusted, committed to national sovereignty and self-determination. While it’s true that al-Husseini, in concord with Ottoman-informed Turkey, joined the Axis Powers in WW 2, military alliances don’t necessarily mean they share the exact same political ideologies but rather have compatible objectives towards a common enemy. For the Grand Mufti it meant a popular resistance against the more powerful Jewish and British occupation, and fighting against the Zionist terrorists such as the Haganah, Menachem Begin’s Irgun, and the notorious Stern gang, which terrorized hundreds of thousands of Palestinians. The idea of sharing their land with an invasion of an anti-Islamic Zionist people of foreign origins and ending Arab control was unacceptable to al Husseini. From the beginning, al Husseini and many Palestinians rejected the Balfour Declaration and fought against the locust invasion of Jews from Europe. IN A 1952 LIFE MAGAZINE interview, Haj Amin al-Husseini defended his tie to Hitler and claimed he never advocated a mass murdering of the Jews. But in the warped brains of Jews, militant Arab nationalism anti-Zionism trying to push invaders out of their historical homeland, means “Evil German Nazis”™ in Arab skins. AND NETANYAHU’S COMPLAINT that al-Husseini advised Hitler to “burn the Jews” in order to brand Arabs as having an inherent ‘anti-Semitic’ strain, is laughable since Arabs are authentic Semites. Apparently, it was a Sheldon Adelson funded think tank, Jerusalem Center for Public Affairs, that fueled Netanyahu’s talking points. Asserting it was the Evil Arab™ Grand Mufti that masterminded a ‘final solution’ of European Zionist Jews, truth is, those ‘innocent’ Jews stole the lawful properties of Palestinian Arabs and ran a terrorist war of their own against them and the British Mandate. The motive behind the Mufti’s cooperation with Hitler is plain and simple. An ardent Arab patriot, al-Husseini fully believed a German victory would facilitate the liberation of Palestine from Judeo-British imperial control. I am at a crisis in my ministry. I am in a fight for survival. FEWER and FEWER are supporting me financially. This coupled with being thrown out of my apartment December 31 with no place in sight for me to go. What a bold and wonderful Article. In the photos of al Husseini and Hitler, there’s a visage of clear conscience and patriotic men of dignity, while the satanic Jewish spirit is imprinted all over the faces of the Brits and Jews. I love the locusts in the montage, too. How appropriate–Jews truly did descend on Palestine like locusts, and if they couldn’t buy, bribe or trick the Palestinians, they resorted to terror and murder to get their way. The various forms of Arab and Muslim nationalism arose from the various currents of 19th century Romantic Nationalism, just as the European nationalsims did at the same time, many Muslim political thinkers from the Arab, Iranian and Turkish worlds studied at British and European schools and universities. Currents of various 19th and 20th century nationalist political philosophies cross fertilized each other, and each form of ethnic nationalism had it’s own distinctive “flavor”. Many points of German National Socialism’s economic and social program was particularly attractive to nationalistic Arab and Muslim political thinkers framing their own economic philosophies and political movements bring various Muslim societies into the modern age of the nation-state. Thank you for bringing some sanity to Nuttysatan’s latest verbal vomit justifying his brutality towards Palestinians, and the fury it has caused, especially from those Shoah Business Jews who work night and day to keep the special Jewish “Holocaust” myth alive. Pardon me, BroN, but you seem to not see that the “Nazi” word was first coined by an Ashkenazi Jew publication which was mocking, vilifying Hitler during his potential rise to power..
And while you do see much of the Jew Lie, I differ as to the Germans being the so-called “Nazis.” That is no more, no less but the JEW PRESS propaganda that has vilified all those who were heroes, those who went/go against the Ashkenazi Rothschild Usurer Scam World Banking System, the Jew. And it is now incontrovertibly clear that the Holocaust was/is pure propaganda from the same JEW PRESS, and the real JEW-led holocaust events like the Ukraine-famine and Soviet-Gulag-camps and Maoism to only name 3 are never mentioned by that Filthy Lying Jew Press, while the numbers of humans abused and slaughtered in those events were in the 40 MILLIONs and up!!! And the false Jew Holihoax has been shown to be less than 1 million, including all deaths that would occur with any group be they persecuted or not. In a context of war the JEW had declared war on Germany from Germany’s very loin. NO Gassing ever occurred, again now irrefutably proven. Your article leaves it open for those who are unaware to assume the Holocaust event was real, when the Americans had the same type camps all over the United States incarcerating all dissidents and Japanese folks! I can say much more about it, but this should suffice as a secondary set of knowledge out of our research at sheoplenews(dot)com. Your work is magnificent and much other work from many other outlets pale in comparison. We hold the highest respect for your presence on Earth. You do courageously name the CRIMINALs, whereas many fail to. The “Nazi” designation should indeed be avoided, since only the Jews like to use it. The one thing that I like about Islam is its rejection of usury, which Hitler clearly understood is the way the Jews achieved so much power. So I am not at all surprised that a loose alliance developed between the National Socialists and the Muslim world. I only wish more gentiles would take this issue seriously, and realize that it is the Jews and not Muslims or “Nazis” that are posing the real threat to all of humanity. We could actually begin to make some headway if this were the case. My meager donation is on its way, Bro. If I possibly could, I would send you thousands of FRNs! You are doing the best work that I know about on the Net. I have learned so much from you. As much as don’t like the Islamic religion, it seems that Pamela Geller is a “CIA asset” with the task to help incite any rioting that she can. There is quite a contradiction from many authors and historians in relation to the Grand Mufti of Jerusalem and Arab hero, Haj Amin al-Husseini. This is also indicated when histories regarding Mustafa Kemal Ataturk are recorded and even taught in schools. It is strange considering Ataturk was a Zionist, Gay, Traitor, Freemason and a British Agent. The ‘Young Turks’ society consisted mainly of Jews. They were the ones who murdered over 1,000,000 Armenian Christians. The same prevails in regard to the histories of World War I, World War II and particuljarly regarding Hitler and Germany. If anyone is prepared to dig, to research and to discover, proofs of the lies placed upon the public mind and conscience will be exposed. 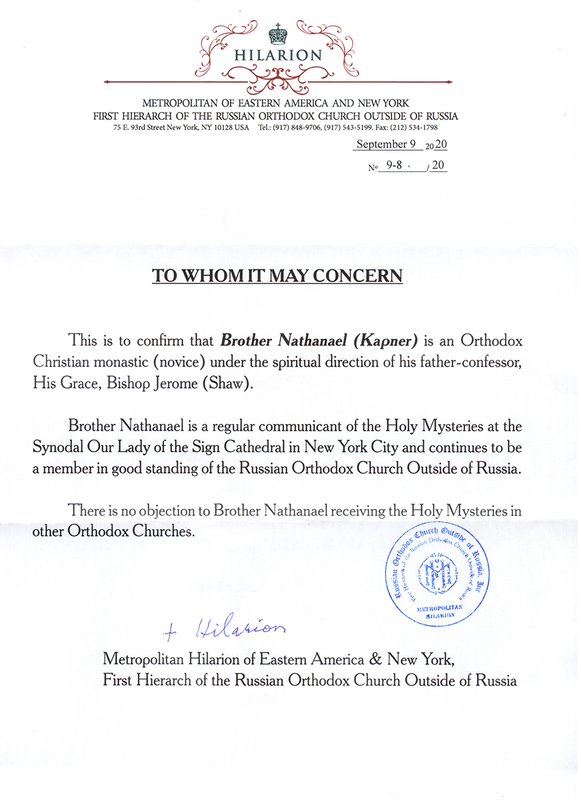 It is obvious that Brother Nathanael is a master of true history, research and the actualities particularly in relation to the present subject. The general consensus of opinion among the great number of American Christian authors regarding these matters is that Germany and Hitler, were rotten to the core, that the Grand Mufti was a criminal and that Kemal Ataturk was a shining example of a Turkish Moslem leader who revoked much of Islam to establish a secualr society in Turkey after World War I. This is not astounding when one considers the unmitigated, fraudulent and witchcraft imposed bias among the Christian population of millions. Again, it is a Jewish plot of Jewish lies and Satanic chaos and disorder. In the face of some Christians and intellecutals being writers of the truth, there is this enforced resistance to swinging from the position of being deceived to becoming undeceived. 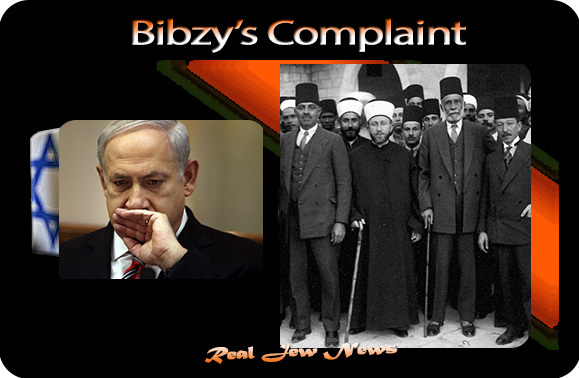 That the British allowed Zionists in their society has been a sad truth for centuries. Zionism was incorporated among the beliefs and in actions of the Establishment and many of their Prime Ministers. Then the Zionist, John Nelson Darby, produced the basis of all the End-time beliefs followed by scores of millions today. The ignorance regarding Hitler, Germany, both World Wars, Zionism, Israel and the Arabs is most alarming because such is at the bottom of many present political moves. From this condition, there has sprung in our times a string of wars that are passed off as being the fault of Moslems. I am a Christian and not a Moslem but I have lived among Moslems in a few countries. Faults in all areas are always obvious. Nevertheless, the present-day xenopohobia regarding Islam among evangelicals and their brothers, is false and rather outrageous. This has occurred despite the obvious murders contrary to Christianity of large numbers of Palestinians who have the real Semitic heritage among their Arab population. They also embrace many of our Christian brothers. And these massacres are perpetrated by the falsely declared ‘people of God and of the Abrahamic Covenant’, who have no little or no Semitic genes. This fact the Christian Right should admit. All of the torrid support for Israel as brought on by the Balfour Declaration and throughout the years, with shouts of glee from Christianns, is a blot on society. One has heard the cheers and felt their vibes for many a year. They have all arisen out of total falsity. Doubtless there will never be peace in this world but there should be the hope that truth can be discovered even growing like a pansy in some hidden verdured spot among the woods. Thanks Brother Nate, another great article! Love the last line of your post. I can almost hear Ethel Merman singing “there’s no business like Shoah Business, like no business I know”. It will be interesting times when Jewry has used up any good graces bestowed them and have gotten themselves cornered by their own rant. The face (”anti-Semitism”) keeps changing race. 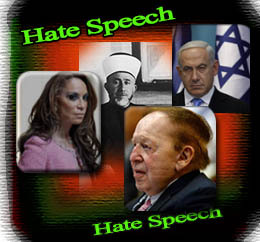 Once upon a time, these special slanderous accusations hurled only at the White race will have to be hurled at the Arab race, the Black race, the Asian race, etc, because they too will wake up and know the truth and we know Jewry cannot handle the truth! Pardon me, NIQ but I see one glaring piece of untrue propaganda in your post. (By the way, thanks for informing me of the origin of “Nazi”.) You included Maoism as one of the Jew-led holocaust events but I’m afraid you don’t really know much about the history of China. Although Maoism was a Chinese adaptation of Marxist Leninism, it was first and foremost a nationalistic movement, seeking freedom from Western imperialism, including the Western bankers. Yes, there were a few communist Jews from the West who moved to China to help the Maoists, along with several non-Jewish communists from countries like the USA but you have to remember that the great majority of Jews at that time were either active communists or at least communist sympathizers and they hated the Jewish-led banksters of London and New York as much as anyone. To get the main point of your post, there was no holocaust in the 1950’s and 1960’s in China under Mao Zedong. That was nothing but Cold War propaganda from the CIA. Instead, there were several severe famines in China during those years in which millions of mostly peasants died. There were various contributing factors that caused those famines, including mismanagement but the main causes were the Western embargoes on trade and banking with China and China’s urgent need to industrialize and build up its military because the threat of a nuclear attack from the US was very real. The Maoists had no motive for killing millions of peasants, who were the backbone of the Chinese Communist Party. Even the “landlord class” of people were not killed by the Maoists, who preferred to “re-educate” these fellow Chinese, although a few of them were killed, as happens in the turmoil of revolution. If you saw the movie, “The Last Emperor”, which was based on truth, you will recall that the Maoists didn’t even imprison (for long) the last emperor, PuYi who was a genuine traitor to the Chinese by siding with the Japanese for several years. In conclusion, if you are such a stickler for truth, not propaganda, then you need to include the propaganda of your own government. I agree that International Communism in those days, and still today, was actually controlled by the Jewish-led bankers but the sheeple followers of that doctrine were not (and still are not) aware of that fact. But under Mao Zedong, the Chinese Communists were barely influenced by these behind-the-curtain controllers. It was the Soviet Union, under the Bolsheviks, that was manipulated by the bankers. There is no great mystery as to where the scare word “nazi” came from despite many clever theories. In Yiddish, which all German and Eastern European Jews spoke, and which borrowed Slavic elements borrowed into the language, nationalism is pronounced natsyanalizm borrowed from the Slavic forms. In Russian and Ukrainian, borrowed from the Latin, nationalism is natsionalizm. In Serbian it is nacionalizam and in Bulgarian natsionalizŭm. In German, while it is spelled Nationalismus, there’s a ‘ts’ pronunciation -Nat(s)ionalismus. The Anglophones tend to pronounce it as nashionalism. If the NSDAP had called themselves “Nazis” it would be the equivalent of communists calling themselves “Commies.” Palestinians don’t call themselves “Pallies,” but that is a favorite Jewish pejorative. This would obviously be an insult, so I don’t think the Germans and Austrians did that, although there are times when a group will adopted the enemy’s perjorative name as a badge of honor. There is a human tendency to shorten lengthy words to diminutives in the neutral sense, or use acronyms, such as the Russians turning the very unwieldy Glavnoye upravleniye lagerey), the “Main Camp Administration” into “gulag”. It was the short form of the official name which was even longer. It wouldn’t take long for the Yiddish-speaking Ashkenazi Jews to turn “natsya” into a perjorative Semitic pun, especially if it was already in use by German opponents of the NSDAP. “Ignatz was a popular name in Catholic Austria, and according to one source in World War I Nazi was a generic name in the German Empire for the soldiers of Austria-Hungary. “An older use of Nazi for national-sozial is attested in German from 1903, but EWdS does not think it contributed to the word as applied to Hitler and his followers. “The NSDAP for a time attempted to adopt the Nazi designation as what the Germans call a “despite-word,” but they gave this up, and the NSDAP is said to have generally avoided the term. Before 1930, party members had been called in English National Socialists, which dates from 1923. The use of Nazi Germany, Nazi regime, etc., was popularized by German exiles abroad. [Jew-know-who]. “From them [the tribe that can’t be named], it spread into other languages, and eventually was brought back to Germany, after the war. “In the USSR, the terms national socialist and Nazi were said to have been forbidden after 1932, presumably to avoid any taint to the good word socialist. Soviet literature refers to fascists. And Herr Hitler was both German Austrian and a Catholic as well as the chief of the NSDAP, so it’s pretty clear who the Jews and their propaganda word “natsy” were ultimately targeting. MAOISM was wholly instigated via the same infiltration by the CRYPTO JEW Brits who went after this region on Earth just the same they do all, in one word, drugs. The Crypto-Jew Brit East India Co. and the Opium Wars were only the prerequisites of that plan and although in all situations will be encountered a concurrent natural genuine dissent from The People (as is common in any country) seeking to better the system, those movements are hijacked by this JEW MAFIA and then reported as the main thrust of the HORROR, an easy no-brain perfect cover. I think/know not to fall for that old trick… and we have a small-small microcosm of that in Ukraine that is as obvious as JEW is not. The Khazars are falling, their power is falling apart and they all will be destroyed. The time is approaching and the Khazars will have to run away and this time, the real holocaust will happen as it never happened before. The Israelis are liars, killers and murderers, psychopaths. @KathJuliane … wow… IMPRESSIVE, but useless. I tend to not get into these sorts of pit-pats, but there are times where my amber just can resist the air-flow. I see your response as the typical over-intellectualizing of the advanced mind which forgets that advanced is but dust in the ocean of humanity. An educated person such as you is trained in digging for the nooks and crannies of an issue, and although that is actually wonderful, then mire (subjunctive) the basic truth in a thick bush of rhetoric and semantics backed by so-called sources which are the hammer of force behind the impression sought to leave no room for else. I have learned over time that the majority of people will not even bother to read, decipher, make the effort to fully understand any advanced writing… as they quickly fade away and distance themselves from the stress to settle with even a false interpretation. …and there we have it, a book collecting dust! So, my approach is to see it at the level where the CRIMINAL sees it, the level that allows that CRIMINAL to know what to key on to control the events. It is easy to spread the guilt on all humanity and include those who are of the same bucket and happen to be dissident against their own… that is meaningless. One will always be able to cut an issue in 2 halves of the same pear. It justifies nothing, nor excuses the rot at the core as to even fall in the comparison. And in fact that is the main vein of the divide and conquer tactic which would hardly ever blow into a full-fledged fire be it the instigator was not present, the catalyst, the hundreds of names that has taken over time all the way back to the basic false story self-victim HOAXODUS farcical tug at the simple mind. …and it is the simple mind which is lured into carrying the gun, and made to take the brunt of that fire. …and to solidify the basics, it is indeed the Jew Press which keys on that very simplicity and plasters the simple lexicon(s) all over the planet for all the small minds to munch on. Latest I checked, it was not the other way around. Thus the so-called outsiders you mention who from afar, and glorified as being of the same bucket, have not any more weight than any of the rest of the operators on that side of the equation, the operators being what drive the machine. Remove just that part of the catalyst, and things come to a sudden rest… surely not perfect and clear of cat-fights, but certainly not the ORCHESTRATED HORROR we all face. Placing the blame across the entire spectrum of humanity serves to obfuscate the very ENEMY who may actually be the one to stand in the midst as the source of the same. …not making allusion to you proper, but stating the mechanism. No offense meant to you, I indeed appreciate intelligence and a high mental level, but doesn’t it boil down to the expert not being such an expert after all!? Those of us who are able to see, need to realize that the basics that allow one to approach chimps and succeed in having them let one enter their circle and be accepted, should align with that level (the famous lady who is credited for such accomplishment may have been assassinated)… the CRIMINAL automatically does (align), while (he) feeds you the ‘at-infinitum’ intellectualizing to occupy your common-sense. I hope to not be interpreted as offending, rather to have made point….and to be clear, in this context, the point is that the JEW PRESS is the operator! The Young Turks were crypto Jews called Donmeh, and Kemal Ataturk was probably also really Jewish, as at the time ataturk was born, the huge majority of Thessaloniki’s population was Jewish, and guess where Ataturk was born? Seems that in a pretty short timeframe four huge empires has been destroyed by the tribe. First the Ottoman Empire, then the Russian Empire (85% of leading communists being Jews), the Austro-Hungarian Empire, and than the Chinese empire which was 2 times heavily attacked by the Jews(Opium Wars, Japanese War sponsored by Jacob Schiff) until it became communistic with most non chinese communists being Jews (with the usual results communism gives to its people=genocide, cultural & amp; spiritual destruction). Similar to current USA activities where freedom and peace brought to you by the USA=mass killing, and color revolutions all around the world=chaos. Checking for the word in the Jew York Times, The first 20th century usage of ‘holocaust’ to refer to World War II appeared in 1940. Previously, “holocaust” on occasion was used in the sense of a conflagration or inferno–as in the destruction of Europe in WWI, or of revolutionary wars where people must be sacrificed for the sake of the revolution, but nothing specific to the Jews. The next occurrence of the term appears in in an full page ad taken out in the Jew York Times on p. 13 by the New Zionist Organization of America, a branch of militant Revisionist Zionism Movement of Jabotinsky. In this ad, they are demanding a free, Jewish state in Palestine. They note that Jews around the world are fighting alongside the Allied forces in this “holocaust of blood and sweat and tears.” This usage of holocaust refers more to the war in general then to the specific actions taken by the NSDAP against the Jews. But that’s because the ad was taken out by no less than Benzion Netanyahu (Mileikowsky), Bibsy’s father and personal secretary to Ze’ev (Vladimir) Jabotinsky. After Jabotinsky died, Netanyahu became executive director of the New Zionist Organization of America, the political rival of the more moderate Zionist Organization of America. Benzion haunted Capitol Hill spent a lot of time lobbying various Congress members. There was a major, coordinated, relentless, organized Jew propaganda machine conducting political warfare on the emotions and brains of Americans from Hollywood to New York, from cinema to spectacular big-crowd galas, Broadway stage plays, and roadshows. This was prior to age of television, and these were all major forms of media that reached into every home and community. Look up Bergson Brothers, an activist arm of the militant Revisionist Zionists in America. Peter Bergson was in reality Hillel Kook. Ben Hecht, a famous and popular Hollywood producer, director, and screenwriter threw his all into pushing for and supporting the future Jewish state. It appears that it was Weisel who popularized “holocaust” so that it became “The Holocaust” in the lexicon of American English. People are going to read my comments, or they have the choice to pass it by when they see my name. Grand Mufti visited Bosnian Muslim SS troops, just before they attacked the Serbian Christian Orthodox population in Croatia. Every military/political tactic Hitler used against Serbia was emulated by Nato in the 90’s and beyond. Simply put; Nato finished what Hitler had started. The Dream of the Poem - Hebrew Poetry from Muslim and Christian Spain 950-1492. Thank you for the detailed history of “NAZI” and “holocaust” terms. It’s so obvious that even an Israeli media source says so. But will our own? Of course not. Is US planning to cut its under sea data cables? So what! He was our last chance on this planet for sanity. As we now see, most left on this planet truly are insane. Give up everything for Christ, but Christ for nothing! The culture destroying gluttonous Jews appropriate everything and then call it their own, particularly when it comes to food. Most people think East European cuisine is Jewish. It isn’t. The truth is, the mastery of Russian, Ukrainian, Polish, Lithuanian food has always belonged in the hands of the unassuming home cook. Jews ran the taverns and inns on the great estates and byways in Western Russia, ripping off the peasant serfs of their livestock and produce. That’s why Eastern European food is popularly thought to be “Jewish,” but all they did was give it a little kosher twist, then crow about inventing it. The Humble Servants Of Jesus Christ. BLESSINGS TO YOU DEAR FAITHFUL ONES! Jews are really nothing but lying vermin attempting to run a hoax on anybody dumb enough to listen to their crap. In lieu of that, the creeps try to insure that you can only hear and see their garbage-nothing else. That is called totalitarianism. That is the antithesis of freedom. Possible US FALSE FLAG maneuver - & Jew PROPAGANDA demonize and blame the Russians. KathJuliane: What do you think of the Noahide Laws and do you think they will come to pass in the US? If wasn’t an Arab, it was some Putin, or … Some Gaddafi in Lybia, or some Saddam in Iraq, or some Assad in Syria, or … A new Hitler is always around the corner. Why us the Jews? This site is unparalleled. The jews lies documented. Photo after photo from the jews “media”. - EVERYONE they glorify are installed phonies, fabrications. That pattern is so obvious, how can so many of you NOT SEE THAT HITLER WAS NOT A FASCIST but one who was forced to do war, and in war one cannot wait for the ballot of the chimps to make decisions! nor make decisions that fail the element of surprise. Putin gave JEWsrael and the JEWmericans 1 hour to get their planes out of his way in Syria, after he told everyone in someway at the UN they had no intention to meddle in Syria, then caught the CRIMINAL West with their/its pants down… and made them all suddenly long faced. Without the element of surprise the JEW machine would have removed all equipment and personnel….. hmmm! of course not! So, is Putin a Hitler now!? All of you better hope so, because if the BRICS do not make it, your children are under the JEW BEWT for a 1000 years! Mankind is in the abyss! Will China be vilified as a communist GANG, an Empire on the move! You bet it will, already is! While the simple truth is: The Bear is awakened and The Dragon has its back… that simple! Learn to speak to your flock in the same type sound bites the enemy has used on them so much. Again, staying on the surface, so that anyone of layman level, has no difficulty interpreting the dialog and taking a position in debate/action rather than be spread thin on a million minute useless details, left undecided, lame and limp, with no direction. When bullets fly, no time is left for intellectualizing. YOUR enemy is the Jew/Freemason same as Hitler went against, and that beast is infiltrated in all society down to the village size communities! They even sucked-in the Blacks via the Prince Hall Lodge and now women, who were strictly excluded in the past!! Right here in your face at home… same in my country! If everyone knew to surround every town-hall one morning and hold in arrest all judicial, cops, bankers, and government offices, and held the military personnel from reaching their work–and stated, you are safe, until we have investigated this–if you are clean you will be let free, if not–lamp post! It would more than likely all go down mostly smoothly with minimal damage, avoiding the catastrophe we all face. Yes I am dreaming, but that is what you should place your time in, before this thing blows up in horror! …or horror is on the way! Is Judaism an invincible force? How long shall they kill our prophets while we stand aside and look ? Brave Brother Nathanael fights should help aware and awake America, but America seems to be a lost nation. Pound broadcast at least 120 original editorial and manifestos over Radio Rome in Italy from 1941 to 1943. We are reprinting two of these broadcasts to encourage discussion of them and to point readers toward the entire book. The enemy is Das Leihkapital. Your Enemy is Das Leihkapital, intemational, wandering Loan Capital. Your enemy is not Germany, your enemy is money on loan. And it would be better for you to be infected with typhus, and dysentery, and Bright’s disease, than to be infected with this blindness which prevents you from understanding HOW you are undermined, how you are ruined. The big Jew is so bound up with this Leihkapital that no one is able to unscramble that omelet. It would be better for you to retire to Darbyshire and defy New Jerusalem, better for you to retire to Gloucester and find one spot that is England than to go on fighting for Jewry and ignoring the process. It is an outrage that any clean lad from the country - I suppose there are STILL a few ENGLISH lads from the country - it is an outrage that any nice young man from the suburbs should be expected to die for Victor Sassoon, it is an outrage that any drunken footman’s byblow should be asked to die for Sassoon. And the big Jew has rotted EVERY nation he has wormed into. A millstone. Well, an exceptionally good swimmer MIGHT conceivably be cast into the sea with a stone tied round his neck. He might perhaps untie it. If he were a Scotchman, he would remember his jackknife, before being thrown overboard. All right, say that Franklin Delany swipes ALL South America–to what end? And ruin the United States of America while he is doing it. What’s that to you? It is not England’s salvation. Will you ever LOOK at the story of empire? You are NOT even in the mercantile system, you are in a fake mercantile system, not even mercantile. It was for a time called mercantile or the mercantilist system and defined as considering the happiness of a nation to consist in the amount of MONEY it owned, and its process to consist in STEALING, welching, pouching the greatest possible amount of same (i.e., of money) from other nations. And it will not save you. NOR will Judaized Russia. Nor will the Kahal, the Jew’s central committee of bleeders. WHAT is their system? Unvarying, cheap goods, sweated out of cheap labor, dung dust hurled on the world, the WORLD conceived as sweat shop, to hell with the 8-hour day, down with abundance. DUMPING sweated goods, dumped against any and every nation that pays a just price for labor. That is your ALLY. Yeah, I have been following this story. David Duke did a segment on it on his radio show. I’m wondering when the hell Americans are gonna wake up or if they will ever wake up. Working on NEW Video now. Hope to post tonite. I will be voting for Abba and Yeshua in 2016 and everyone else can go to hell! It’s amazing how the ZioJew can rewrite history. Now that they have focused their wrath on the Islamic religion they have chosen a new victim. 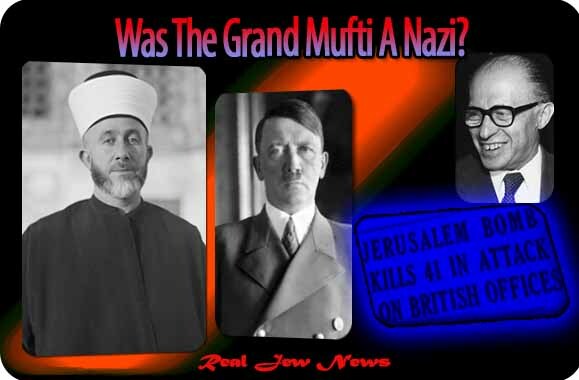 Instead of the German SS and Himmler and the rest, now it’s the Grand Mufti. They have always demonized him. I can remember movies back in the 50s and 60s that portrayed him as a German “Nazi.” Guns of Naveron was one movie I remember. And the Christian Zionist Clergy that has TV miniseries every Sunday are saying terrible tings about the Muslims such as killing them. Van Impe and Hagee are some of them. Unbelievable that they get away with this. If I said kill Jews here, the FBI would be at my door with guns blazing. And there is no let up. Just look at the presidential candidates. All, Democrat and Republican, are Ziocon Israel Firsters and have said they will start wars with Syria, Iran, N. Korea, China and Russia. Can you imagine how stupid the American public is. It’s embarrassing to even say that you are an America. They cheer these Maniacs. And they will if they don’t do the same! Let us unite in prayer for those, within our halls of “power” (with a small p, thank you), who are exibiting any indication that they might want to pledge allegiance to THE POWER over all powers! Who would not fear Thee, O King of the nations? There is none like Thee, O, Lord! The holohoax is easy. At least three million Jews lived in Poland and that is the key to understand what really happened. All the Jews in Poland simply moved to the jew ruled Soviet. Scroll down to about mid page and read the Jews own words about what really happened in East Europe and where all the Jews went, to Soviet. The Jewish Western Bulletin den 15 augusti 1941 More than 1,000,000 Jews have been evacuated into the Russian interior with the aid of Soviet authorities from the three major Russo-German war fronts, it was reported in Russian quarters here. Do you really buy that the Wehrmacht had the time and manpower to round up Jews? it sounds to me as if you have bought the narrative of the holohoax. If you check to see who really are the soldiers supposedly shooting Jews, its not the German Wehrmacht but the Ukrainian, Latvian, Estonian and so forth SS volunteers who went after Jews who had been extorting them for decades. And the Ziojew cabal has used a few films to propagandize the world as if it was a mass effort of the German Wehrmacht. Not so. They were too busy fighting with the Russian Red Army and never had any intention to do what the Jew has propagandized the world with the holohoax.